We have heard it over and over again. 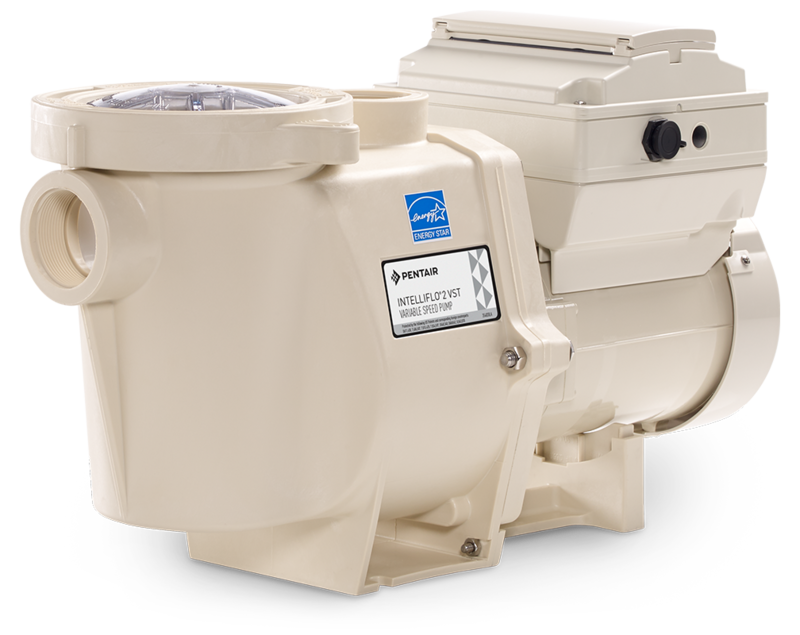 A client tells us that their pool builder or service company said a 3 horsepower Pentair Intelliflo pump is too big for their pool. It’s oversized. It’s overkill. It will destroy their pool plumbing. It will drain the oceans dry, trap baby seals, and eat all of the lobster in the sea. We are big fans of big pumps. Why? Because they can run slow, quiet, and last a long time. That’s the whole idea of a variable speed pump. Really it’s a variable speed motor attached to a pump with a fixed impeller. You adjust the motor speed to change the flow rate. By “oversizing” the motor you can run it at a slower speed. The result is super quiet and cool operation with long service life and a huge operating range to satisfy any flow rate for pool features and maintenance. You might be surprised to find out that the i1 and i2 are the exact same motor and drive as the full Intelliflo 2 VST. They reduced the horsepower by just changing the pump impeller. The manufacturer did this to satisfy specific regulatory requirements regarding maximum flow rates in California and Arizona. What is the result? You have to run the motor of these reduced horsepower pumps at a higher speed to achieve the same exact flow rate. That means more noise, more heat, and theoretically shorter service life. Even if you don’t think service life will be affected, noise is absolutely a factor. And guess what – these two pumps cost the same amount as the full Intelliflo 2 VST! The Superflo VS 1.5 HP pump is a different motor and pump design. It does cost slightly less. But the result is that the pump motor must run at a much higher speed to achieve the same flow rate as the Intelliflo 2 VST. Again, more noise, more heat, reduced service life. 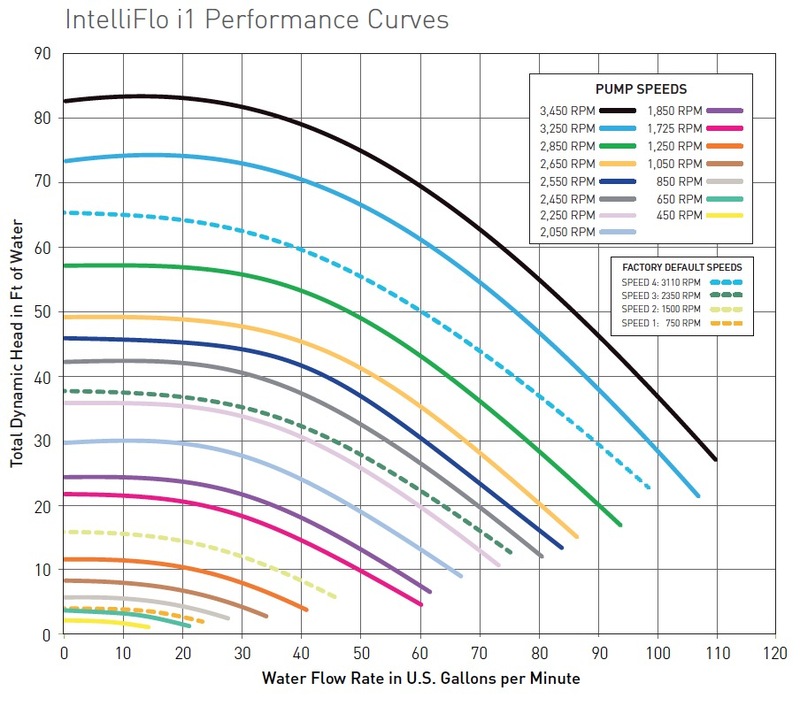 While the pump does cost less, you have to buy a separate interface cable to connect it to automation systems, and it does not have the same automation options as the flagship Intelliflo series. Why on earth would you install a reduced horsepower i1 pump when for the same price you can get an Intelliflo 2 VST with three times the horsepower? Just run the higher horsepower pump at a lower speed! 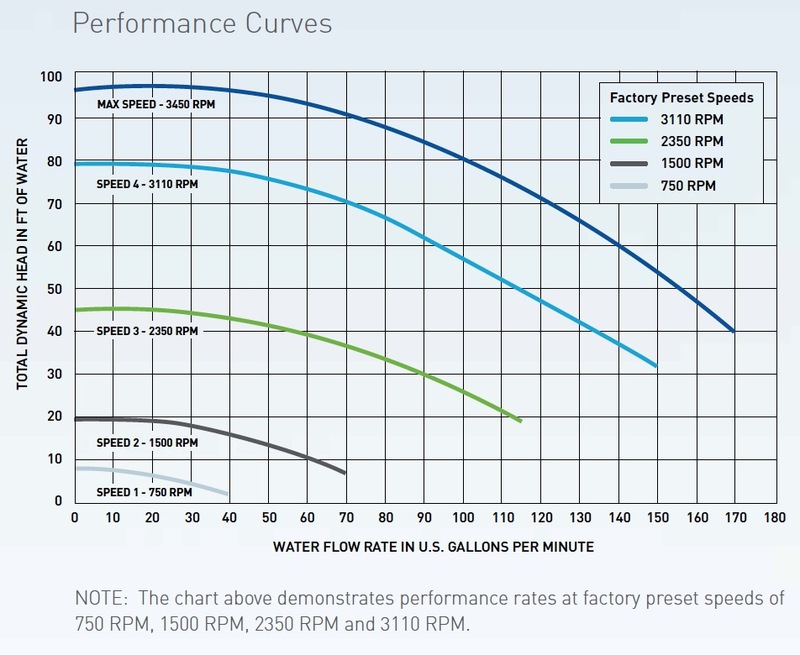 If you look at the performance curves for the two pumps, there is no question about the required motor speed to achieve a given flow rate. For example, to achieve a 55 gallon per minute flow rate at 40 feet of head, the 3HP pump needs to run at 2,350 RPM. The 1HP pump needs to run at 2,700 RPM. Now you may think that one of the two pumps will require more energy to run because of this phenomenon. However, in a pure physics sense, work is work. The same amount of work is being done (55 gallons per minute at 40 feet of head). The energy requirement differences will be negligible. The only time the 3HP pump will use more energy than the 1HP pump is when it is doing more work than the 1HP pump is even capable of doing. Stuck in the old days. Doesn’t understand physics. Focused on initial cost alone. Bamboozled by marketing. We’re not sure exactly why your pool builder or pool service professional isn’t on board. We’re not even sure why one manufacturer even distributes the reduced horsepower variants in Florida. There may be a good explanation. We’re not pool professionals. But we are energy professionals, and we do understand pool flow and pressure dynamics. These are critical factors for solar pool heating. The same thing applies to other manufacturers’ offerings. Hayward offers their Ecostar, Tristar VS, and Maxflo VS models. Jandy offers their ePump, VS FloPro, and VS PlusHP models. These pump series fit different price points for various pool designs. But the fact remains – for little to no extra money you can get a much more capable pump and run it at a slower speed. The flagship “bigger” pumps also tend to have the most features, automation connectivity, and best warranties. We do get one thing. Marketing drives sales. If you don’t truly need a 3HP pump, why buy a 3HP pump? Hopefully we have answered that here so you can have a discussion with your pool professional about what you want. We strongly suggest “oversizing” your variable speed pool pump to get the most out of your purchase. Hello, can I use this pump for my pond? Also, can you program this pump to run at a lower volume at night and a higher volume during the day automatically? I am currently running a Pentair 1and 1/2 horse power single speed motor which runs great but is costing me a bundle. Do I need any other accessories to go with this pump? Thanks for the info. I don’t see any reason you can’t use an Intelloflo pump for a pond. It sounds like a great idea. Yes, you can have up to 8 scheduled run scheduled, each with it’s own speed.